When using yam powder as thickener, mix the powder with hot water first to make a thick smooth paste (as if you are making pounded yam) before adding it to the soup. Adding the powder directly into the soup will make the soup mushy and you may end up with lumps. When the catfish is almost done, add the crayfish, pepper and utazi leaves blend. 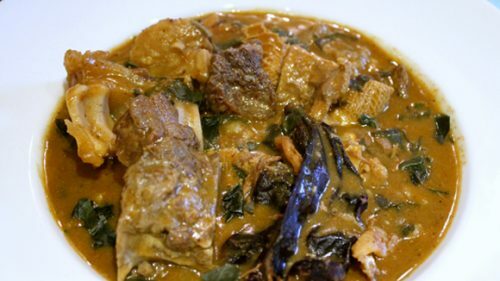 Also add the yam paste in small lumps and salt to taste.Note: Catfish is what makes Nsala soup what it is, giving it the unique taste that it has so it is essential to this recipe. The only other fish that I have found to be close to Cat fish as regards to this recipe is Conger Eel.